Kaija Saariaho is a magician in sound. (...) The recordings are excellent, capturing this rich yet elusively textured music without a hint of artificiality. The Finnish Radio Symphony Orchestra partner Kriikku admirably in this enchanting concerto and under Oramo's sensitive direction provide beguiling accompaniments for Anu Komsi in the four Leino Songs (...). Ondine's demonstration sound caps a marvellous issue. Recommended. The FRSO explores the alternately disorienting and familiar sound worlds of Saariaho's scores. The (...) clarinet concerto (...) performs enough Gershwin riffs and virtuosic tricks to command full attention for half an hour - and if you haven't heard Kari Kriiku do his stuff, you must. (...) Best of all is a short, fluttery set of four Leino Songs for very high voice (...) The sound, too, is impressive. This is a superbly produced recording from the Ondine label. Justly celebrated as one of the leading composers of our time, this varied and deeply fascinating programme is as good a place as any to become acquainted with (Kaija Saariaho's) remarkable universe of expressive sonority and mystical depth. Mystik, klangsinnlighet och överskridande återkommer hos Kaija Saariaho. (...) eine Musik, die unerhörte imaginäre Räume öffnet, die scheinbar durch mehrere bis dahin unbekannte Dimensionen wandert und den Hörer auf einen Weg mitnimmt, von dem er sich bisher nichts hat träumen lassen. (...) Es ist nicht die banale Schönheit populistischer Machart, sondern die Schönheit eines unbeugsamen ästhetischen Anspruchs, der sich aus sich selbst heraus rechtfertigt - und dabei unmittelbar überzeugt. (...) Sehr empfehlenswert! Luulisi, että klarinettimestari Kari Kriikku ei voi enää ällistyttää enempää kuin on jo lukuisissa konserttolevytyksissä tehnyt. Mutta kyllä voi. Kriikku's playing of the phenomenally demanding solo part is no less impressive on disc than (...) in the hall. This new CD release combines three recent works by Kaija Saariaho (2011-12 Composer-in-Residence at the Carnegie Hall in New York) and brings together some of Finland's finest ambassadors of music. 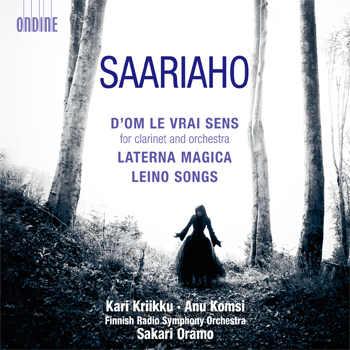 Star clarinetist Kari Kriikku ("a physically flamboyant player of Olympian virtuosity" - The New York Times) is featured on the much awaited premiere recording of Kaija Saariaho's first clarinet concerto D'OM LE VRAI SENS. In the composer's words, "the general idea of this piece is based on the famous medieval tapestries called La Dame à la Licorne [displayed at the Musée de Cluny in Paris]. The subject matter is the five senses and the 'sixth sense.'" The Finnish Radio Symphony Orchestra, here led by its chief conductor Sakari Oramo, performed the acclaimed world première performance in September 2010. Kari Kriikku has inspired many other native composers to write concertos for him, subsequently recorded for Ondine: Magnus Lindberg (2006 BBC Music Magazine Award & Classic FM Gramophone Award), Uljas Pulkkis, Jukka Tiensuu, Kimmo Hakola, and Jouni Kaipainen. Also included are the 20-minute orchestral piece Laterna Magica, co-commissioned by Stiftung Berliner Philharmoniker and Lucerne Festival, and a cycle of four Leino Songs (on poems by Eino Leino), written for the acclaimed Finnish soprano Anu Komsi.